What is hydroplaning? Many times a motor vehicle driver, who was involved in a rainy weather accident, will say "I hydroplaned". When queried further, that driver may say "I was just driving along when suddenly the car gave out from underneath me," or "I hit the water and suddenly lost my steering". The question posed here is whether any such described incidents were clearly what are classically defined as hydroplaning. Dynamic Hydroplaning occurs when a moving tire is completely separated from the pavement by a layer of water. As the tire moves over a wet surface, the bulk of the water is normally removed by the normal force of the tire squeezing the water from beneath the tire footprint through the grooves in the tire and the texture in the pavement. Dynamic hydroplaning usually occurs at speeds above 45 mph. Viscous Hydroplaning only occurs on wet pavements with little or micro-texture. The typical example is a pavement with flushing (bleeding asphalt that completely covers the surface). 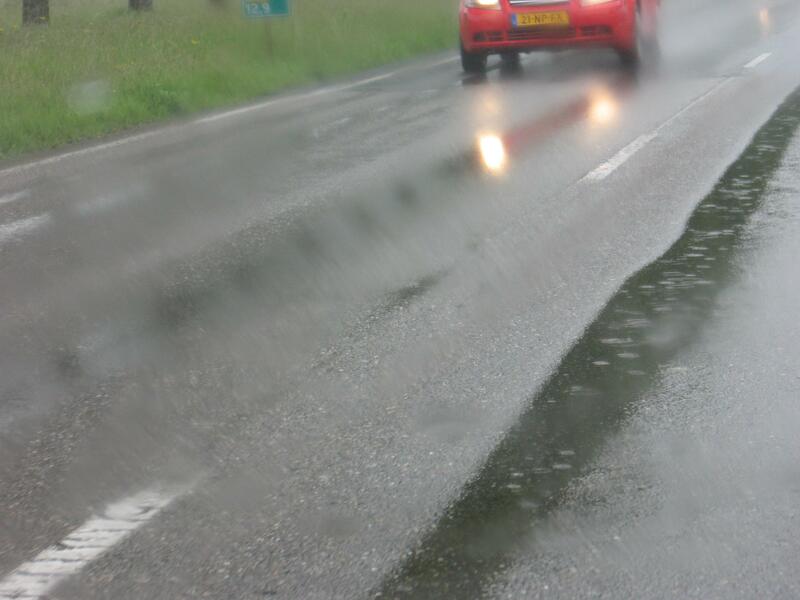 Viscous hydroplaning can also occur on pavements that have been polished smooth by traffic. With viscous hydroplaning, a very thin film of water continues to separate the moving tire from pavement because of insufficient micro-texture to break down the water film. Viscous hydroplaning can occur at any speed. Tire-Tread Rubber Reversion Hydroplaning only occurs when drivers of large trucks lock their wheels at high speeds on wet pavements that have good macro-texture but little micro-texture. Now, back to the question of whether a particular loss of control can be clearly described as a classic hydroplaning incident. Clearly, viscous hydroplaning is a reasonable conclusion for a sudden loss of control in the absence of any severe braking or steering under wet conditions if a highly-polished or highly-flushed pavement is involved. Otherwise, the conclusion may not be so clear. Determining whether hydroplaning other than viscous hydroplaning occurred is much more difficult because of many potential factors and their interactions. As will be seen later in this discussion, the easier question is whether sudden loss of control occurred because of higher speeds, marginal tires, low skid resistance, too much water on the pavement, or, more likely, some combination of these factors. Therefore, for the purposes of this discussion, hydroplaning will be defined as the insipient loss of control on wet pavements under any set of operating conditions other than severe braking or steering. 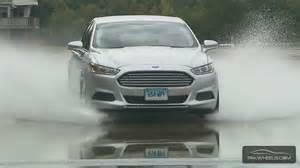 Most drivers, who experience hydroplaning, are surprised by the sudden loss of directional control. Hydroplaning occurs under a wide variety of wet weather conditions. Although sudden loss of control can occur under heavy rainfall with very high vehicle speeds, it can also occur right after rainfall ceases with moderately high vehicle speeds on pavements with very little texture. 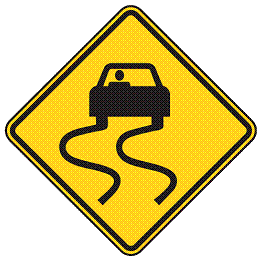 Then too, hydroplaning can occur with moderate rainfall and moderate speeds where pavement wheel ruts with long pavement drainage paths allow critical water depths. A roadway agency concerned with minimizing the occurrence of hydroplaning can only exert minimal control over vehicle, driver, and environmental factors. It can, however, identify and correct roadway locations that demonstrate a susceptibility to hydroplaning. Although several kinds of roadway situations produce the opportunity for hydroplaning, the most prevalent places are where pavement has bleeding asphalt, where water builds up such as at the bottom of sag vertical curves, and on pavements with noticeably compacted wheel tracks or ruts. These locations are usually corrected by asphalt mix overlays designed and constructed to increase the cross slope, eliminate rutting, improve the micro-texture and macro-texture of the surface, and provide a surface resistant to wear and compaction. Where funding for resurfacing is not available over the short term, roadway locations prone to hydroplaning can be treated with reduced speed limits and slippery pavement warning signs as low-cost interim countermeasures. This paper focuses on the effects of pavement wheel ruts on vehicular hydroplaning. The major questions for expected combinations of tire tread depth, tire pressure, and pavement texture are (1) What water depths are critical for various highway speeds? and (2) What rut depths will produce critical water depths? Pavement wheel ruts are continuous longitudinal surface depressions in the wheel path. Ruts are particularly evident during a rain, when they are filled with water. Ruts not only fill with water and cause vehicle hydroplaning, but also can be hazardous on dry pavements because they tend to pull a vehicle towards the rut path when it is steered across the rut. Rutting usually occurs on asphalt roadways where high traffic volumes and/or frequent heavy wheel loads cause compaction of the pavement. Underlying causes of rutting can be: (1) insufficient compaction of asphalt layers during construction (if a layer is not compacted enough initially, an asphalt pavement may continue to compact in the wheel paths under traffic loads); (2) subgrade rutting as a result of inadequate pavement structure; (3) improper mix design or manufacture (e.g., excessively high asphalt content, excessive mineral filler, insufficient amount of angular aggregate particles); and (4) wear caused by studded tires. Excessive Asphalt Cement (AC) Content: Excessive AC will fill voids in the asphalt pavement intended to provide stability under traffic loading. The pavement will become plastic and ruts will permanently form in the wheel tracks. High Dust/Asphalt Weight Ratio: The normal range for this ratio is 0.6 to 1.2. When too much dust (smaller than 200 sieve) is added to the mix, the ability of the AC to bond with the fine and course aggregates is lessened, resulting in cracking and rutting. Polishing Aggregates: The use of limestone, dolomite, and other soft aggregates that polish under traffic loading should be forbidden or controlled. Over time, the pavement surface will become polished, and will provide little or no skid resistance. Improper Course Aggregate (Rock) Size and Shape: The quality of the course aggregates is most important in asphalt pavements. If the size and shape are not as called for in the construction specifications, the bond between the rocks and the AC can be weakened, thus causing rutting. Improper Compaction of In-Place Asphalt Pavements: One indictor of a properly compacted pavement is the percentage of air voids in the mix. If the pavement is over-compacted during initial placement, the percentage of air voids will be low, causing plastic flow of the mix and rutting in the wheel tracks. If the pavement is under-compacted during initial placement, the percentage of air voids will be high, causing ruts to form when the traffic loading compacts the mix. The most widely recognized method of measuring wheel ruts is to, (1) place a 3- to 4-foot rigid straight-edge perpendicular to the roadway across the rut and, (2) measure vertically from that straight edge to the pavement at the maximum depth of the rut. Yet another method uses computer controlled electronic equipment in a moving vehicle to scan pavement elevations. A companion paper2 on this website, Roadway Hydroplaning - Measuring Pavement Wheel Rut Depths, describes some caveats with both these methods and discusses how to properly adjust the straight-edge method measurements to account for cross slope. State DOT maintenance practices regarding pavement ruts vary in both the type of concern and the dimensions of that concern. Where one state seems concerned about pavement smoothness and rideability, another seems concerned with vehicle tractability, and yet another seems concerned about hydroplaning potential. When these states specify the dimensions for critical rut depths, the values range from about 0.2 inches up to about 0.8 inches. With regard to hydroplaning on higher speed highways, no clear definitions have been advanced, first, on what critical water depths are for hydroplaning at various speeds; and second, on what rut depths will create critical water depths. Although many studies about hydroplaning have been undertaken, this paper will focus on the research done at Texas A&M in the 1970’s. An initial project by Stocker, et. al.3, the only one of its kind, conducted full-scale testing of automobiles that related wheel spin-down to speed, water depth, pavement macro-texture, tire tread depth, and tire inflation pressure. Ten percent wheel spin-down was chosen as the indicator of insipient hydroplaning. Testing during the study indicated that almost full dynamic hydroplaning was present with as little as 10 percent wheel spin-down. Based on the data from these 1,038 tests, with wheel spin-downs of 10, 30, and 60%, a subsequent study by Galloway, et. al.4 developed a best-fit equation with an 85% correlation coefficient. The predicted speeds from this equation lie within + 5 mph of the test speeds. In exercising the equation here, 10% wheel spin-down was used, consistent with the recommendation of the research report, to indicate insipient loss of tire contact and/or loss of control. Figure 1 shows the sensitivity of insipient hydroplaning speed over a wide range of pavement macro-texture depths and water depths for nominal tire pressures and tread depths. 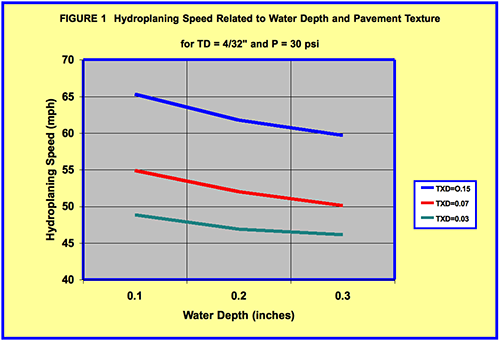 What this graph shows is that for a roadway agency to minimize hydroplaning requires not only pavements with relatively high macro-texture but also pavements that are designed and maintained to avoid any significant water depths. 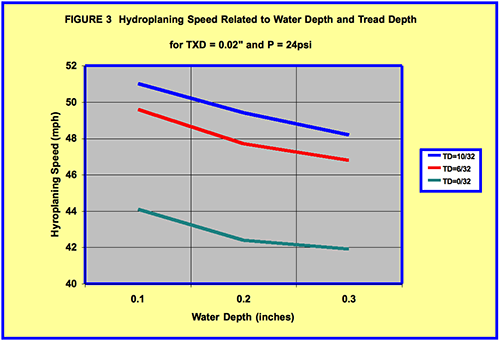 Figure 2 shows the sensitivity of insipient hydroplaning speed to tire pressure for nominally low values of tread depth and pavement macro-texture for various water depths. What this graph shows is that insipient hydroplaning speed is sensitive to tire pressure over the range of 18 to 36 psi. 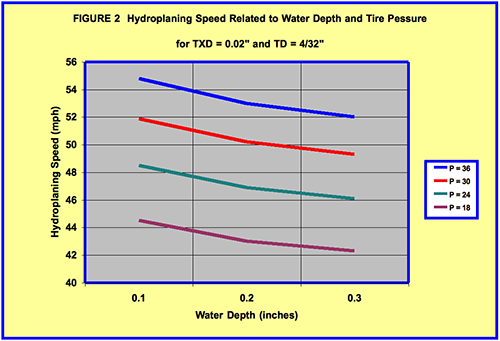 Figure 3 shows the sensitivity of insipient hydroplaning speed to tire tread depth for nominally low values of tire pressure and pavement macro-texture for various water depths. Here the hydroplaning speed for 0.1 inches of water is about 7 mph greater for a full tread over a bald tread. Figure 4 plots a wide variation in hydroplaning factors from very good to very poor suggesting that hydroplaning speed can vary substantially. Clearly, higher speed roadways, higher water depths, lower tire pressures, lower tire tread depths, and lower macro-textures lead to higher hydroplaning potential. Although several different arguments can be made, this graph seems to indicate that as Stocker, et. al.3 said, “for water depth of 0.1 inches, roadways should be operated at speeds no higher than 50 mph”. 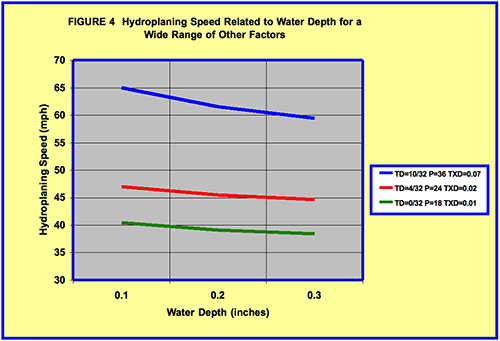 Given that critical water depths decrease with increasing speed, a rational selection of critical water depths would vary with speed such that a lower depth than 0.1 inches be used for higher speeds, a 0.1-inches depth be used for mid-range speeds, and a higher depth be used for lower speeds. Perhaps this range of values centered around a nominal 0.1-inch water depth yields a reasonable balance between spending huge sums to fix all wheel ruts versus not adequately addressing the hazards of hydroplaning at all. Vehicles with the lower tread depths and pressures might still hydroplane at lower speeds. the data has some uncertainty and insipient hydroplaning speed might be lower than predicted here. The tires and pavements tested were not totally representative of more modern tires, leading to more uncertainty. If tests had been conducted at lower water depths, lower critical values might have been indicated. Wheel ruts have a tendency to have less macro-texture and may experience viscous hydroplaning at lower water depths. Predicted hydroplaning speeds are for free-wheeling tires. Perhaps a driven tire would be more susceptible to hydroplaning because of the possibility of at least some minimal braking and acceleration. Drivers need to be attentive to keep their speeds lower and their tire pressures and tread depths higher. the data has some uncertainty and insipient hydroplaning speeds might be higher than predicted here. The probability of having sufficient rainfall to produce 0.1 inches of water may be rare, unless geometric conditions are contributory. Even under fairly extreme rainfall conditions, a wheel rut may not be full of water for more than a few minutes. To further refine what water depths are critical in wheel ruts, consideration should be given to what factors can be expected on our highways. For example, Reference 5 accounts that 15% of all passenger cars on our roadways have about 4.4/32-inch tire-tread depth or less. And what about tire pressure? Reference 6 accounts that 15% of all passenger vehicles on the roadway have about 21 psi or less in their tires. Then too, Reference 7 says that a 0.02-inch macro-texture could be representative of the polished pavement in a wheel rut. These three values seem like reasonable starting points to determine critical water depths as a function of hydroplaning speed. 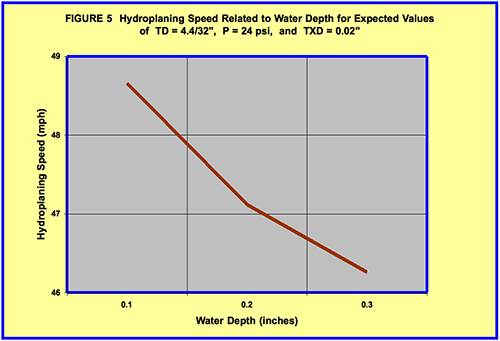 Using these threshold factors of TD=4.4, P=21, and TXD=0.02, the equation given above can be used to solve for suggested critical water depths for various speeds, as shown in Figure 5. 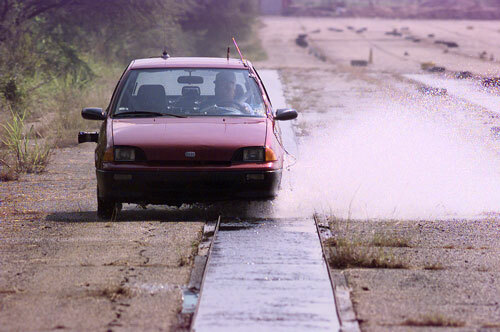 Unfortunately, because the full-scale tests were only run at water depths of 0.12-inch and above and speeds between 40 and 60 mph, any extrapolated values using water depths below 0.10 inches may yield unreasonably low estimates of hydroplaning speed. 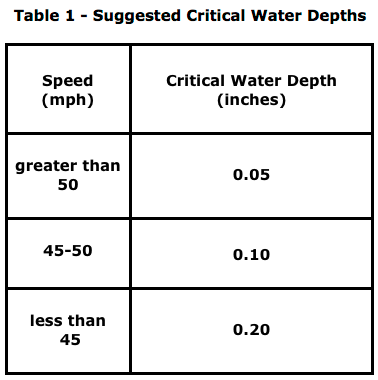 Therefore, in the interest of what seems reasonable, and considering the uncertainties expressed above, the lowest critical water depth selected was 0.05 inches and the highest critical water depth selected was 0.20 inches as shown in Table 1. 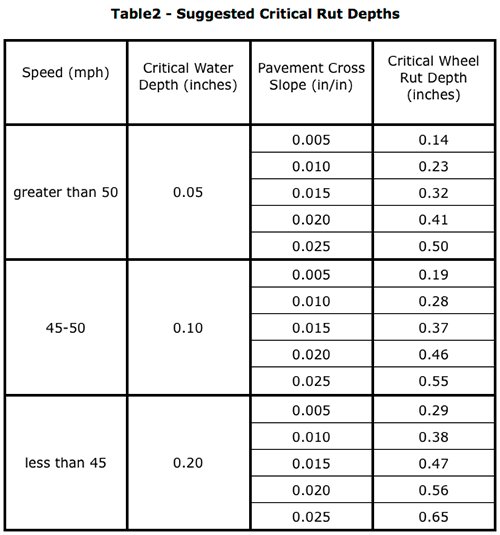 As shown in the companion paper2 on this website, Roadway Hydroplaning - Measuring Wheel Rut Depths to Determine Maximum Water Depths, the common method of placing a 3- to 4-foot straight edge across the wheel rut to measure the maximum wheel rut depth needs to be adjusted to account for the cross slope in order to calculate the maximum amount of water that the wheel rut can hold. Although the determination of critical water depths deserves further scrutiny, Table 2 should provide both a framework and perhaps some reasonable guidance on how to address wheel ruts in the interest of minimizing hydroplaning. Notice that, when considering wheel ruts that may need attention, pavement cross slope is paramount. When the pavement cross slope is relatively flat, relatively small wheel rut depths may be problematic, particularly at higher speeds. Conversely, higher cross slopes tend to be less sensitive to the hydroplaning contribution of pavement wheel ruts. Another very important consideration is the local area of the wheel ruts. The priority of treating pavement wheel ruts is heightened when those ruts are located in areas of higher rainfall intensities and/or where longer pavement drainage lengths supply greater volumes of water to the ruts. Horne, W.B., Tire Hydroplaning and its Effects on Tire Traction, Highway Research Board, Highway Record 214, 1968. Glennon, John C., Roadway Hydroplaning - Measuring Pavement Wheel Rut Depths to Determine Maximum Water Depths, January, 2015. Stocker, A.J., Dotson, J.T., and Ivey, D.L., Automobile Tire Hydroplaning: A Study of Wheel Spin-Down and Other Variables, Texas Transportation Institute, Research Report 147-3F, 1974. Gallaway, B.M. et. al., Pavement and Geometric Criteria for Minimizing Hydroplaning, Federal Highway Administration, Report No. FHWA-RD-79-31, 1979. Thiriez, Kristin, and Subramanian, Rajesh, Tire Pressure Special Study - Tread Depth Analysis, National Highway Traffic Safety Administration, October, 2001. Tire Pressure Survey and Test Results, National Automotive Sampling System Crashworthiness Data System (NASS CDS), February, 2001. Ivey, D.L., et. al., Texas Skid Initiated Accident Reduction Program, Texas Transportation Institute, 1992. 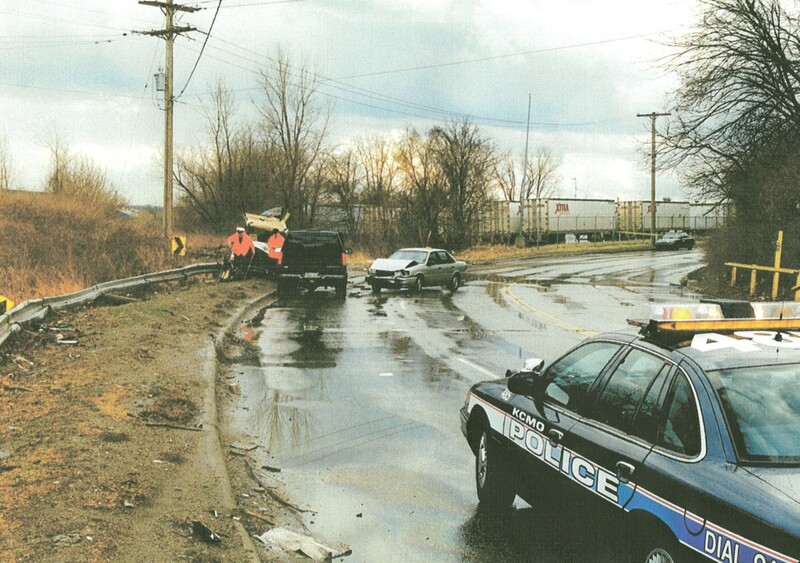 Glennon, John C., Roadway Safety and Tort Liability, Lawyers and Judges Publishing Co., 2004.